Zest the outer lemon rind and set aside. Squeeze the juice from the lemon into a shallow dish. Whisk together the lemon juice and olive oil. Add half the lemon zest, 1 teaspoon of the tarragon, salt and black pepper. Stir to combine. Add the shrimp to the lemon mixture, coating well. Cover with plastic wrap and refrigerate for 30 minutes. Cook linguini according to package instructions until al dente. In large sauté pan, melt butter and add chopped shallots. Cook over medium heat until shallots are translucent (do not brown). Remove marinated shrimp from refrigerator and transfer to sauté pan with shallots. Increase heat to medium-high and cook shrimp until they turn pink, turning half way through (about 30 seconds per side). Remove shrimp from pan and set aside. Add chardonnay to pan and cook until reduced by half, stirring with a wooden spoon to release any brown bits from the bottom of the pan. Add remaining lemon zest and tarragon to pan. Add the Classico® Creamy Tomato & Roasted Garlic Pasta Sauce and bring to a simmer while stirring occasionally. Once sauce is simmering, stir in half & half and remove from heat. 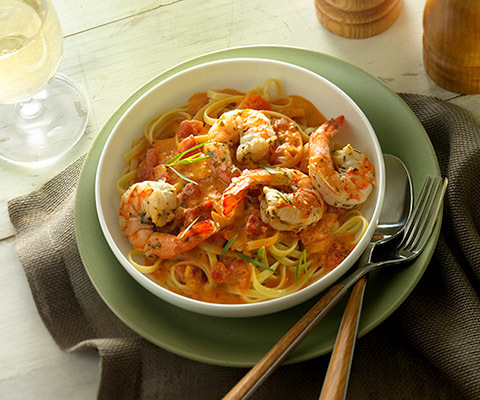 Toss cooked linguine with sauce and top with cooked shrimp. If desired, substitute Classico® Light Creamy Alfredo Pasta Sauce with Classico® Creamy Alfredo Pasta Sauce. TIP: If desired, substitute 1/2 lb. of thinly sliced pancetta with 1/2 lb. of thin sliced bacon. I made the pasta recipe last night and I was disappointed. The pasta was way to dry and there wasn’t nearly enough shrimp. 3. The half & half looked as if it starting to clabber (?maybe because of the lemon juice?) even without simmering so the next time I will either use a cup of ricotta or perhaps a white sauce. 4. Increase the amount of sauce to 1 full jar (24-25 oz.) of tomato sauce. 5. Sliced Kalamata olives, about 6 and about 6 medium mushrooms, sliced or quartered. The good thing about this recipe was a nice hint of lemon in the overall sauce. It was very pleasant. I will try it again with these changes. BTW, How much tarragon did you intend to use, 2 tbsp. or 2 tsp?